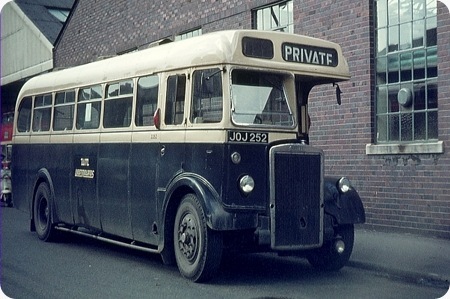 PMT went through various vehicle shortages in 1969/70 mainly as a result of the unreliability of the Roadliner fleet which was sucking maintenance resources from the rest of the fleet. East Midland and Trent loaned Tiger Cubs but a real surprise was the hiring of up to nine of these quite antiquated looking buses from West Midlands PTE. They were absolutely immaculate inside and out and with plenty of power from the 0.600 engines in such a small vehicle. This particular bus had three periods on hire of which this was the third, earlier it had the Birmingham coat of arms rather than the WMPTE logo on the side. They were unsuitable for OMO so ended up in many cases on heavily loaded urban services normally operated by 72 seat Atlanteans or Fleetlines – not ideal. The bus is pictured outside Stoke Depot on 19th April 1970. Fortunately a number of these splendid and reliable vehicles have been preserved. 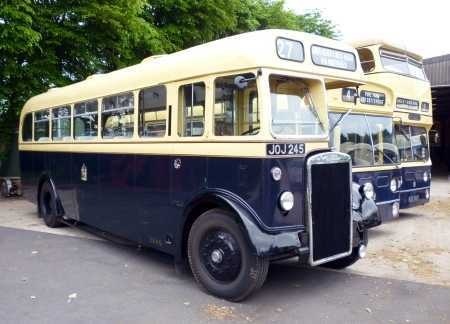 This example looking resplendent at the Wythall Museum in 2010. Strange how these vehicles had chromium plated radiators as late as 1950. I believe Manchester Corporation specified them also. Manchester Corporation had chromium plated radiators on their PD2 Titans right up to the final batch delivered in the mid-sixties. These were invariably painted red at the earliest opportunity completely ruining the appearance of the elegant Leyland exposed radiator and giving a very tatty appearance to the vehicles. I believe the pressed metal chromium plated radiator cost less than the cast aluminium unit which by this time was the norm. Previous posts on this site have referred to the then GM, Albert Neal having a frugal approach to vehicle purchasing. I have to disagree about Manchester painting the chromium plated radiators red "at the earliest opportunity"
Certainly there were many examples of over use of the spray gun but the majority of the PD2s were not so abused. Parrs Wood depot in particular, which had a majority complement of PD2s, was known for "spit and polish" and it wasn’t until very late in the 1960s that the standard dropped, with the exception of a couple of the Northern Counties bodied PD2s of the 1953 batch which received their 1958 spray booth scheme second repaint in the mid 1960s when loaned out to another depot (Sharston if I remember) and were left looking less than happy compared to their stable mates. I always used to think that chromium plated radiators were painted into fleet livery at some later date but surely this cannot be. It would be virtually impossible to apply paint on top of chromium plating and it would very quickly come off anyway. The necessary treatment, I imagine, would be to immerse the thing into a sort of acid bath to remove the plating prior to applying paint. Does anyone know if this was the case, or if the radiators were simply replaced as complete units? The radiators weren’t replaced. Albert Neal, under whose regime the so called overall red scheme came in and during which period most of the Leyland radiators were painted, was far too frugal and beset with the problem of balancing the books for that. The Leylands that were so treated were generally allocated to primarily Daimler garages, or received their treatment whilst on loan to them. From 1953 all Daimlers had tin or fibreglass fronts and were all red and were just put through the bus wash. The Leylands were supposed to have had their chrome work wiped off after passing through the wash, so presumably the Daimler garages wanted to skip this step. The method used to spray MCTD vehicles from 1957 onwards was a hot spray method which baked the paint on as it was applied. This may have helped the paint to stick to chrome, I don’t know, but I do know that, in general, the paint was extremely shiny when new and even the all red scheme looked good – for a couple of weeks – but the paint rapidly dulled and that on the radiators certainly chipped. Over the last few days I’ve looked at dozens of pictures of MCTD PD1s and PD2s, in books and on the Net as well as using my memory. The vast majority of photos show chrome radiators unpainted, even after the second all red repaint in the mid 1960s. Exceptions are 3000-3049, 3050-3099, 3100-3199 where many of the batches received painted radiator cowls as they had aluminium cowls which pitted and were dull. A couple of the 3300-3329 batch had their chrome overpainted red, as previously mentioned. 3318 at one time had a black cowl which was horrible. One or two of the 3471-3520 Burlingham batch were overpainted later in life – and were then overpainted orange in SELNEC days, so the paint must have stuck OK. The greatest number of examples of chrome overpainting on PD2s happened to vehicles in the batches numbered from 3521- 720, but even these were in the minority.